Speculating over a politician’s cognitive decline is irresponsible. Using data to assess it is a better option. It’s called the Mini-Mental State Exam, and its real power is the data it provides over time. 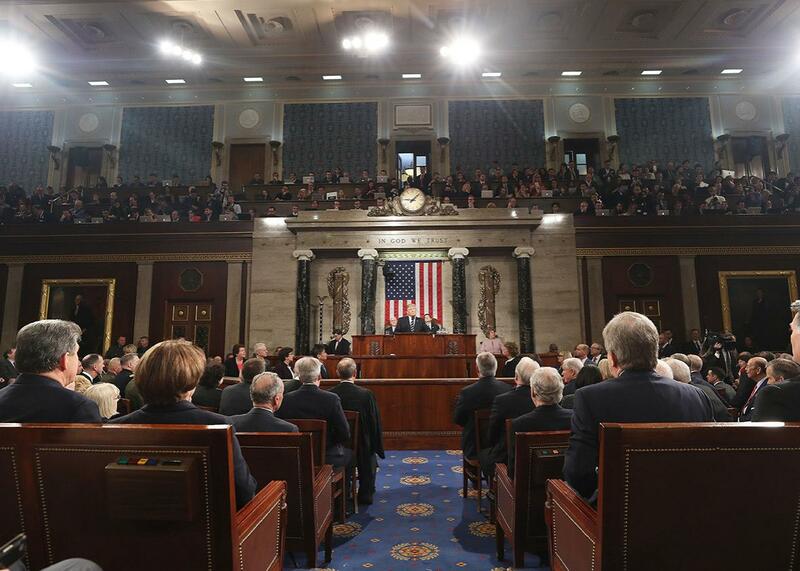 President Donald Trump delivers his first address to a joint session of Congress from the floor of the House of Representatives as lawmakers watch in Washington on Feb. 28. At the end of the James Comey hearing, Sen. John McCain delivered a somewhat bewildering line of questioning, causing many to speculate and wonder over the senator’s cognitive state and health. McCain quickly released a statement attributing the botched performance to sleep deprivation, saying that he stayed up too late watching baseball. But he can be all but assured that the public is likely to watch him closely going forward: The senator, who recently began a sixth term representing Arizona, is 80 years old. Delivering a diagnosis based on a five-minute stretch of a Senate hearing video is bad medicine, and the issues that could cause such a lapse range from minor and meaningless to devastating. But as our politicians get older, concerns about their cognitive health are not unfounded. Approximately a quarter of octogenarians show signs of dementia. That number reaches 37 percent by age 90. And considering that there have been serious suggestions that the president himself might be suffering from dementia (he’s the oldest ever inaugurated), devising a system to assess the cognitive health of the people leading our government seems at least worth considering. The trouble is that diagnosing early or mild dementia is no easy matter. It is rarely something that a physician can determine in one encounter. What matters is how a person fares over the long haul, and even then, it’s tough for doctors to accurately assess decline by only observing behavior. That’s why tests such as the Mini-Mental State Exam are so valuable. In a person with normal cognition, the MMSE takes but a few moments to administer. It assesses a patient’s orientation and his ability to follow a series of instructions, maintain attention, and learn and retain new information. A patient’s score has some inherent meaning, but it can vary greatly depending on many factors, including the person’s education. That’s why a single administration of the MMSE can’t diagnose dementia. There’s not really a cutoff below which the test taker certainly has Alzheimer’s, for example—a low score might be the norm for someone who is not ill, or a high score might mask a highly educated person who is really suffering. What matters most, geriatricians emphasize, are changes in an individual’s score over months and years. This trend, taken in context, helps physicians, patients, and their families to determine the difference between “senior moments” and a genuine cognitive loss. Often, the critical question to assess is whether an aging person’s new and disturbing behavior are merely “senior moments” or whether they amount to genuine “step-offs.” A step-off is a term that doctors use to refer to a noticeable and sudden change in a person’s normal cognitive ability. In and of themselves, step-offs are not diagnostic of any specific condition. Acute confusion, for example, can be a symptom of a dizzying array of conditions, from seizures to stroke to sepsis to, yes, sleeplessness. Once the new problem is diagnosed and treated, the patient returns to her normal cognitive and mental state, known as her “baseline.” Confusion that resolves after an underlying new medical problem is successfully treated has a name: delirium. But unprovoked by one of those (or other) acute medical conditions, sudden cognitive changes are a worrisome sign of an on-going cognitive decline that can’t be stopped (though often it may be slowed with medication). Cognitive abilities can naturally wax and wane, which laypeople describe as “good days and bad days.” Sometimes, step-offs come close together. Other times they are separated by months or years. But when, overall, a decline in cognition is progressive, on-going, and age-related, this condition has a name: dementia. In most lines of work, a person’s cognitive decline is “checked” in some manner, most likely by his supervisor. Sometimes it takes a nudge from a co-worker. At age 80, my grandfather was not-so-gently urged to retire by his physician colleagues. But people who can’t be fired—elected officials, especially those with lifetime appointments—have no such checks in place. Hypothetically, yes, elections are supposed to address this, but a politician’s staff and family often “cover” for the individual—either intentionally or unintentionally. You see the same thing with family members and close associates of anyone suffering mental decline—admitting that such decline is more than just normal aging is an extremely emotional task, so it’s entirely understandable why these lapses might occur. It’s also why I think it would be good policy to ask seniors (geriatric medicine specialists focus on patients starting approximately at the age 65 or 70) in positions of public service to submit to serial MMSE testing. Again, individual scores wouldn’t mean anything, but this would create an unbiased assessment of potential decline over time. Sharing the results publicly wouldn’t have to be required—it might simply be enough for the politician and his or her family and staff to see the writing on the wall and act accordingly. While a mandatory retirement age exists in some fields (such as commercial aviation), in the case of public service, the law is trickier. Congressional term limits, for example, have been found to be unconstitutional and the lifetime appointments of judgeships are already endlessly debated, to little result. I’ll leave the legal arguments on that to the lawyers, and the political complications for others to adjudicate. But instituting a standardized method for evaluating older public servants closely and serially would at the very least provide clear and unbiased information. What they, their physicians, and their families do with the information could be up to them. In my experience, when people are armed with good data, they usually act reasonably. The power of the MMSE is that it provides objective data for something that is almost impossible for those who care about a person to assess subjectively in real time. On-going age-related cognitive decline can be subtle. We don’t notice the tiny changes day to day. If you were to watch a video of your now-ailing father from 10 years ago, you might very well begin to cry when you realized how much he had lost without you ever fully acknowledging it. The human mind is amazing in its ability adapt to new realities, almost seamlessly. As a physician, I often ask “How’s your dad been doing?” to the family member of a patient I am evaluating. A dutiful daughter may reply that “he has good days and bad.” But sometimes another family member shakes her head in disagreement. No, she’ll say, he doesn’t really have many good days at all. Denial is a powerful force. That’s why concrete, longitudinal data can be so useful. As we live longer, and some choose to work longer into old age, the average age of our politicians is sure to rise further. We all know there is a vast array of how people retain mental and cognitive abilities into old age. Some remain completely mentally intact well into their 90s. Others flag decades sooner. That’s the genesis of the cliché that “age is just a number,” and I certainly don’t think we should force people to step down from public service simply due to the number of times they have circled the sun. But a person’s score on the Mini-Mental State Exam is more than just a number: Taken in context, it’s an important indicator of what a person can and cannot do, compared with their previous baseline abilities. More than that, it can aid us all in determining something far more crucial; it can help us identify what patients’ needs are, and what those needs are likely to be going forward, so that we can help them continue to live their lives with dignity.